Band brakes are fairly popular in Japan. Other articles about brakes may be reached through this table of contents. How does a band brake work? A band brake is an inside-out drum brake. Instead of brake shoes that press outward against the inside of a drum, a band brake has a flexible band which wraps around the outside of the drum. The image below illustrates the basic concept. Pulling up on the lever tightens the band around the drum. Band brakes have commonly been used as parking brakes in motor vehicles. Band brakes have also been used as clutches in automatic transmissions. The rotation of a band brake's drum tends to pull the band around it. This results in a capstan effect, which multiplies the braking effect. You can experiment with the capstan effect yourself by wrapping a rope around a tree. Hold each end of the rope in one hand. Pull on one end hard and on the other lightly. If the rope is wrapped by 1/2 turn, you can get it to slip by releasing tension on the lightly-tensioned end. If it is wrapped by 2 1/2 turns or more, no matter how hard you pull on it, it will not slip. Technical details of how the capstan effect works are explained in a Wikipedia article, but here's a simpler explanation: where the lightly-tensioned end of the rope pulls away from the tree, it is in line with the side of the tree trunk, and it isn't pressing on the tree at all -- so the tree trunk isn't pulling on the rope there, at all. After a quarter turn, the tension on the rope is pressing it directly inward against the tree trunk, so friction allows the tree trunk to resist the tension on the rope. The friction, in turn, allows the rope to resist more tension after the next quarter turn, and so forth. So, starting at the lightly-tensioned end, the tension increases as the rope wraps farther and farther around the tree. If the rope is wrapped far enough, a light pull on one end of the rope, or even the weight of the rope itself, generates enough friction to resist a hard pull on the other end. In the image above, pulling up on the lever one end of the band (at a1) tightens the band against the drum. The other end of the band is attached to the lever on the other side of the pivot (at a2), so the the capstan effect also rotates the lever around the pivot and pulls the band tighter. This makes the brake self-locking: if it is applied strongly enough, the band will hold the lever up and keep the drum from turning until the lever is actively pushed down. This is a differential band brake, similar to our example of wrapping the rope around the tree because both ends of the band are active. A bicycle band brake is cable-operated. One end of the band is attached to a lever, and the other end to a fixed stop, so this is a simple band brake. The band is held inside a shell that is attached to the axle inside the left rear dropout. 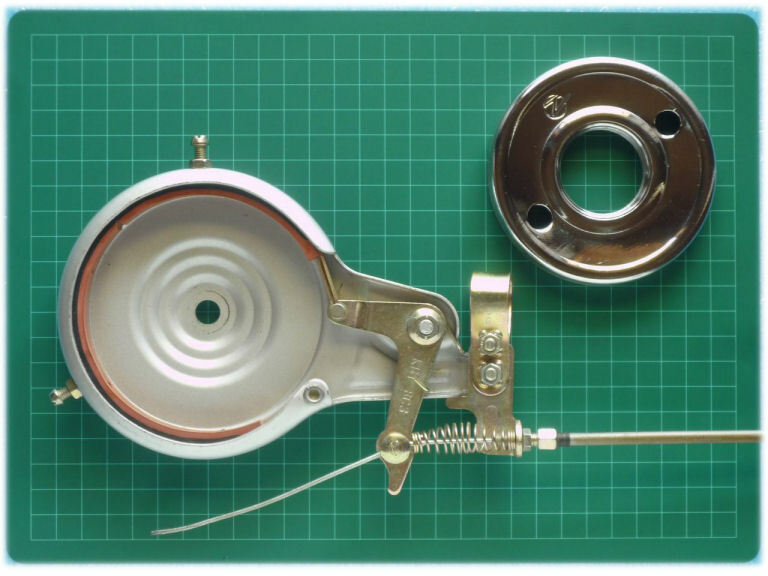 In the photo below, the drum is shown at the upper right and the shell with the band and lever assembly at the lower left. The drum threads onto the left side of the rear hub's axle, and we are looking at the side which faces the hub. The lever attaches at 3 o'clock in the photo, and the stop is at 4 o'clock. The two little adjuster bolts with locknuts at 12 o'clock and 8 o'clock hold the band close to the drum, avoiding wasted motion A clamp on the left chainstay prevents the shell of the brake from being carried around, same as with a coaster brake. A bicycle band brake is not intended to be self-locking, but it is self-actuating -- the length and coefficient of friction of the band are chosen to multiply the force from the cable pull by a calculated amount. The drum turns clockwise as seen in the photo, and so it also tries to pull the band clockwise. A light pull on the lever as 3 o'clock results in tension on the band which increases counterclockwise all the way around the band to the stop at 4 o'clock. Because of the multiplicative effect, a small band brake can be as effective as a larger one of another type. And so, this is the lightest type of cable-operated hub brake. It is lighter than many rim brakes. The mechanism is simple and cheap to produce. A band brake can be used with any hub that has the necessary threading at the left side (same as freewheel threading), rather than being an internal part of the hub like most drum brakes. In theory, the drum could be bolted on like a disk-brake rotor, though I don't know of any such band brake. A band brake requires only a light cable pull, and so it works well for people with small or weak hands. A band brake has a very limited ability to dissipate heat, because the drum is small and is enclosed in the shell. A band brake is OK for stops in flatland but unsuitable for speed control on downhill runs, or for a cargo bike or tandem. The multiplicative effect depends strongly on the coefficient of friction of the band against the drum. If the drum is rusty, for example, the brake may chatter and grab. If overheating causes brake fade, the brake effectiveness is reduced much more than with other brakes. A band brake is largely waterproof, but if water does get into the mechanism, it can greatly reduce effectiveness. Due to the self-actuation, a band brake can be hard to modulate. Skidding a rear wheel may be hard to avoid. A band brake should never be used on a front wheel, but some other kind of brake should be on the front wheel. Typical bicycle band brakes do not have a replaceable band. The entire shell assembly must be replaced if the band has worn out. A band brake is not very good at holding the bicycle from rolling backwards: the capstan effect then works to loosen the band. Thread the drum all the way onto the hub, concave side facing outward. Install the shell so it covers the drum and the band rests directly over the braking surface of the drum. This may require rearranging washers on the hub axle. Tighten the locknut onto the shell. Attach the clamp band to the seatstay. Make sure that the clamp band does not pull the shell out of line. Adjust the adjuster bolts on the shell so the band is just short of rubbing on the drum. Install the cable and adjust it for minimal free play at the brake lever without the brake's rubbing. To remove a band brake, remove the wheel from the bicycle, remove the locknut and the shell, and insert pins (metal rods) into a vise and into two holes opposite one another in the drum. Rotate the wheel backwards to unscrew the drum.